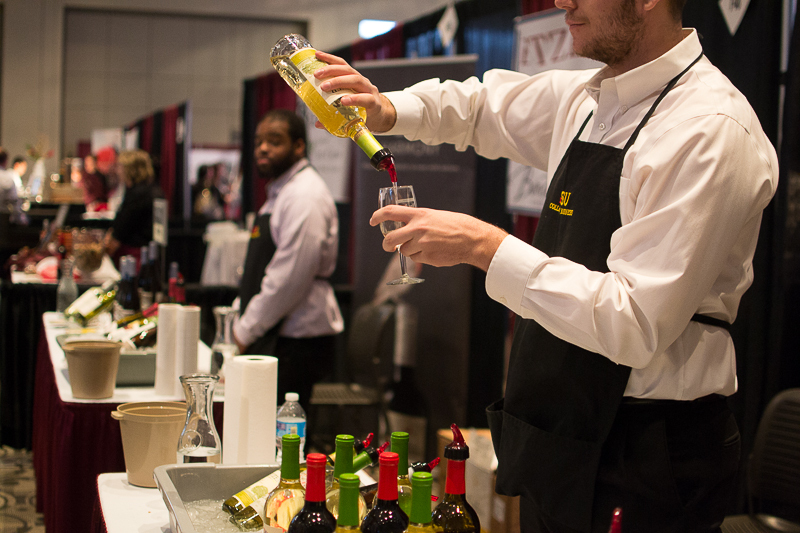 This past weekend the seventh annual food and wine show captivated the attention of many West Michigan residents. Spanned over three days, guests could spend their time attending seminars, sampling local restaurant menus and tasting various beverages. At this year’s International Wine, Beer and Food Festival at DeVos Place, wine was the prominent focus. The Vineyard, or Steelcase Ballroom, was filled with more than 1,000 different wines for attendees to sample. The selection varied from commercial brands to unique local vineyards. 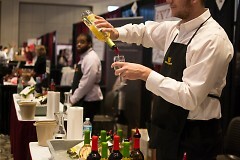 There was a wine for every palate; the hobbyist to the industry expert could be satisfied with the beverages to sample. This year welcomed some new expansions in the other beverages showcased; the Brewers Loft, sponsored by Michigan’s Brewers Guild expanded to the third floor of DeVos Place, and cider also was given its own separate space sponsored by Michigan BLUE. Distilleries were sprinkled amongst the wine options in The Vineyard. With Grand Rapids being such a beer-centric city, it was no surprise craft beer had a larger presence at the festival this year. Local breweries such has Brewery Vivant, Perrin Brewing and Founders all were in the loft alongside other Michigan breweries such as Right Brain Brewery, Atwater Brewery and Short's Brewing Company. Most of the breweries offered their most popular beers to sample, along with a few new releases. Atwater brought along their newly released Lebkuchen Christmas Ale. This ale is named after the German holiday cookie lebkuchen, and offers the perfect amount of sweetness and spice. National beer companies were also present in the loft, but it was evident local Michigan craft beers took precedence for guests. With the cider market recently experiencing growth and popularity, this year the festival showcased more than a dozen cider producers. With Michigan being the second largest purveyor of apples, the majority of the craft cider producers hailed from West Michigan. Virtue Cider based out of Fennville, Mich. brought their award winning craft ciders for people to sample. According to RateMyBeer.com, Virtue is one of the top cider companies in America. While standing near their booth, one could see attendees' tastebuds were in agreement. Also new this year was the expansion of the coffee shop and desserts area. Meant to enhance the guests' total experience, the RendezBREW cafe was in the Grand Gallery and one could enjoy coffees handcrafted by local coffee companies Ferris Coffee, MadCap and Rowster Coffee. Not only could one enjoy superior coffee beverages, but also get a glimpse into the work and dedication of a barista. On the opening night of the festival, Ferris Coffee hosted a latte art throw down for local baristas to partake in. Although it was a competition, the baristas gathered in camaraderie and were having fun practicing their craft and cheering each other on. The weekend festival allowed beverage companies and local restaurants to showcase not only their product, but also their skills and knowledge. They provided guests with the tools to explore new flavors and beverages. Attendees were able to chat one-on-one with the producers of the craft products, and takeaway a new perspective of the world of food and beverage.